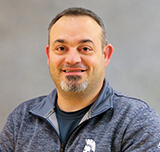 With over 20 years of athletic training experience, ranging from clinic-outreach to professional athletics, including working 10 years in professional baseball and several years at the collegiate level, Rodger returned to the private sector to work with clients of all ages and backgrounds. After being introduced to PRRT in 2012, he was amazed by the power and speed of PRRT. Rodger’s hope is to inspire, excite, and provide knowledge to other like-minded clinicians, therapists and help them implement in the day to day, session to session care for their patients, clients.